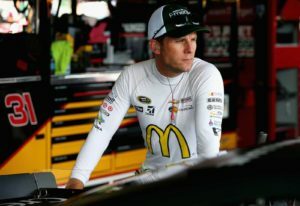 (NASCAR)—Joplin driver Jamie McMurray has made it into the field of sixteen drivers who will fight for the NASCAR Cup Championship in the next ten races. McMurray is one of three drivers in the field without a victory this year. McMurray faced elimination from the field if he had a poor finish at Richmond Saturday night or if another driver without a win this year won the race. The race was won by Denny Hamlin, his third victory of 2016. McMurray’s closest competitor, Ryan Newman, was knocked out of contention early when former teammate Tony Stewart, saying he was unhappy with the way Newman had bumped him, forced Newman into the inside wall. In the process, their two cars caught Columbia driver Carl Edwards, who was trying to go low to pass Newman. Edwards finished 32nd but will be the fifth seed when the Chase begins next Sunday afternoon at the Chicagoland Speedway near Joliet, Illinois. The sixteen drivers in the Chase begin with 2000 points and then get three bonus points for each victory in the first 26 races. Defending champion Kyle Busch, and 2012 champion Brad Keselowski will start with 2012 points. Hamlin begins with 2009. Five drivers who have won twice this year begin with 2006 points: Edwards, Martin Truex, Jr., 2003 champion Matt Kenseth, and Jimmie Johnson—who won the last of his six championships in 2013. Five drivers will start with 2003 points for winning once: Joey Logano, Kyle Larson, three-time champion Tony Stewart, who won his most recent title in 2011, the 2003 champion, Kurt Busch, and Chris Buescher. McMurray, Chase Elliott, and Austin Dillon will begin with 2000. 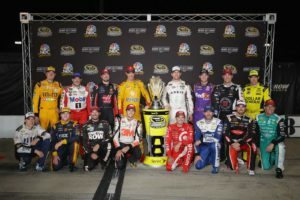 Back row: (L-R): Kyle Busch, Tony Stewart, Kurt Busch, Joey Logano, Carl Edwards, Denny Hamlin, Kevin Harvick, Matt Kenseth. Front row: (L-R): Brad Keselowski, Chris Buescher, Martin Truex Jr., Chase Elliott, Kyle Larson, Jimmie Johnson, Austin Dillon, Jamie McMurray. The four drivers with the fewest points will be eliminated after the first three races in the Chase. Four more will be eliminated after the next three races, and four more will be eliminated after the ninth race, leaving four drivers to go for the championship in the final race. The driver with the best finish will be the champion. McMurray was unable to make the second round last year, his first time in the Chase. Edwards tied Stewart in points at the end of 2011 but Stewart was crowned the champion because he had more wins. (IndyCar)—IndyCar wraps up its season on the road course at Sonoma, California next Sunday. Simon Pagenaud goes into the race 43 points ahead of Will Power. But finishing points are doubled. If Power starts from the pole, wins the race, and leads the most laps, Pagenaud will have to finish no lower than fourth to win the championship. No other drivers are considered in contention. A few days ago, Alexander Rossi, who won the 100th Indianapolis 500 last May, took to the track and to the skies with one of the pilots. The racers will fly between tall pylons with the course covering much of the infield and trackside golf course and spectator areas between turns three and four. 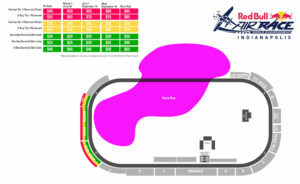 The Speedway has numerous ticket options at https://www.indianapolismotorspeedway.com/at-the-track/red-bull-air-race. (Formula 1)—Next weekend’s Formula 1 race will be the Grand Prix of Singapore. Defending World Champion Lewis Hamilton goes into the race with a two-point lead on teammate Nico Rosburg.